During a recent trip to the Galapagos Islands, a Holbrook guide, who has chosen to remain anonymous on account of their modesty, has stumbled upon a bird species that has yet to be recorded by humankind. He has named it the Golden-egged Shift Feather. Myths and legends have alluded to the magnificent bird, but this is the first known account of human interaction, and Holbrook is able to give you the story straight from the source. It was a beautiful day at James Bay. The skies were clear and the water was calm, and I was eager to use the precious time to point out sponges, snails, and hermit crabs to my group members along the rocky shoreline. Since today’s focus was not birding, I allowed the members to listen to some music aloud – a synergistic addition to the melodic crashing of the waves and the energizing buzz of the coast. When Whitney Houston’s “I Wanna Dance With Somebody” began pouring out of the portable speakers, things took a remarkable turn. Finally, Houston hit the high notes – a series of iconic key changes in a range unattainable for the majority of mortal beings. Suddenly the group began to notice a rustling in the leaves. I moved closer to the sounds in order to investigate. Amongst a collection of rock and shrubbery, I spotted a few glistening mounds that seemed to mimic a sea-glazed stone. After a few more steps, it became clear what lay before me: three golden eggs. The eggs were not surrounded by a nest, a strange occurrence due to their fragility and crucial role in the circle of life. I attempted to lift and take them somewhere safe, but noticed that the weight of them made me unable to even adjust their positioning. Despite their small size, they seem to have such a thick, protective layer that their rocky home was indeed suitable. I hovered for a moment in awe. A blinding force met the back of my head and I turned to meet the subject of astonishing discovery. The bird whose eggs I had disturbed was now circling above me, and with each lap I noticed it changing its appearance. As it passed a rocky cliff, its feathers shifted to hues of coal and ash. When it flew against the backdrop of the pale blue sky, its colors softened to match. And, when it completed its circle before cacti and greenery, it adorned itself in earthy tones. The camouflage bird landed on the sand, where it seemed to turn to flesh before me. Our eyes met for a brief moment, before it scooped the golden eggs effortlessly into its beak and flew away, soaring far into the horizon line. Post-encounter research led to the conclusion that the Shift Feather migrates among the Galapagos Islands, remaining concealed due to its feather’s color-changing capabilities. 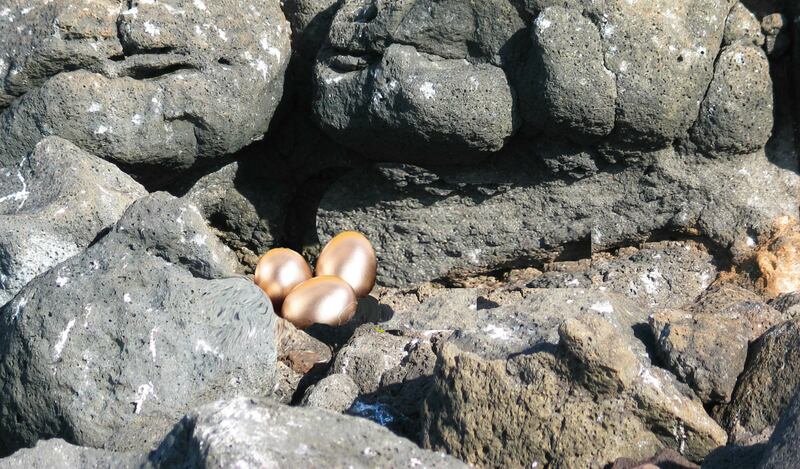 It does not need to settle in a specific location for nesting because its eggs’ gold casings allow for protection no matter where they are placed while its mother searches for food. Its allusive nature is due to the fact that it only appears when summoned – because the call for this creature is the silky voice of an iconic pop-star, it rarely shows itself.